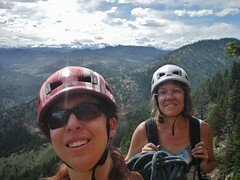 In the slideshow above, I tried to capture the essence of our day hike up Bison Peak, in the Lost Creek Wilderness. It was an amazing hike and included wild rock formations and gorgeous views. Our CMC group spanned many decades, with the youngest member being a teen and the oldest member in their 60s! 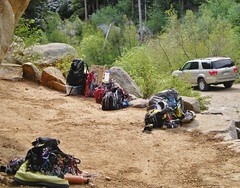 In the month of June, I donated 3 Saturdays to the Boulder section of the CMC (Colorado Mountain Club). I volunteered as an assistant instructor for their summer Rock Leader School. There were two classroom sessions and three field trips. There was a leader (Chris-not pictured), myself, and 4 students (Cary, David, Eric, and Ilene). 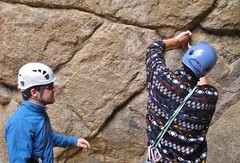 These are pictures from our first field day, where students learned about rock climbing protection. Passive vs. 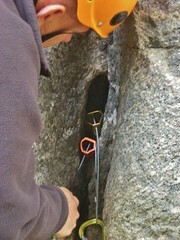 Active, judging the strength of the protection placement, when to place, spacing of the placing, and anchor systems. After training for 6 months, I ran my first Marathon. The Deadwood Mickelson Trail Marathon in Deadwood, South Dakota. It was a proud day for me. What made it the best was Dennis. My loving hubby was at every possible aid station cheering me on, and it was really awesome. At times, I was really feeling the race and having mental problems, but knowing he was there really kept my spirits up. Deadwood, South Dakota is a wonderful little town nestled among the mountains. It has a lot of grit and is an old miner town. The marathon event was planned to a tee and the community really makes racers feel welcome! There were aid stations every few miles with bananas, apples, m&ms, pretzels, and bagels pieces. There was also goo, electrolyte drink, and lots of cool water. For a carb load up, the night before, I would recommend eating at Roma’s Ristorante. It’s about 20 minutes drive from Deadwood, but it’s worth the drive! The biggest challenge with this marathon was at mile 9, I had an encounter with a very mean woman from Texas. She accused me of drafting off of her. We were running uphill with very little/no wind at probably a 9.5 min/mile pace. In other words we were both going…slow! How assinine! 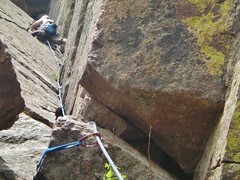 You are currently browsing the climbergirl blog blog archives for June, 2011.